When the weatherman predicts high pressure and plentiful sunshine, aside from lathering on the sunscreen and drinking plenty of water, here’s how to enjoy a perfect bluebird day at Breckenridge. You can bet on a perfect bluebird day, especially if fresh snow has fallen in the past twenty-four hours, everyone from the local ski shop employee to the European vacationer will be itching to get outside. Suit up early to beat the crowds, enjoy early morning solitude and fresh tracks. On a bluebird day at Breck, the surrounding views are astounding. 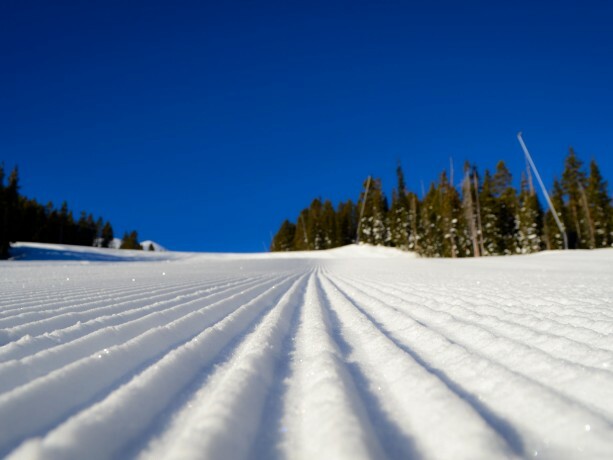 Take advantage and ride the highest lift in North America, Imperial Express SuperChair to the top of Peak 8. A quick hike up to Lake Chutes or Snow White allows experienced skiers views of Copper to the west, Keystone and Arapahoe Basin to the east and “fourteeners” Greys and Torreys. Traverse over from Imperial to Magic Carpet on the top of Peak 7. The town of Breckenridge lays below you, looking like a toy setup from your high perch. If catching air and sliding rails is up your alley, try out Breck’s Park Lane on Peak 8. Just starting out? Build up confidence and technique on Peak 9 at the Bonanza Terrain Park. Or, if you prefer to keep your skis and board on the ground, catch Olympic athletes from all over the world as they train in Breck’s Freeway Terrain Park. 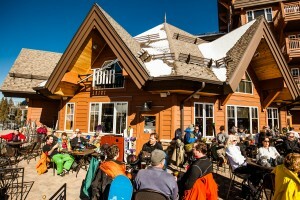 Soak in the plentiful sunshine and refuel on the deck of the new Overlook Restaurant on Peak 9. Enjoy a local, Colorado-sourced meal or bring your own snacks to keep you going on the hill in the afternoon hours. Don’t forget water and to reapply sunscreen. Often socked in on snowy or cloudy days, runs on the upper mountain, such as Whale’s Tail are above treeline and most enjoyable when the sun is shining. Burn off any leftover holiday calories and take a mellow hike up Peak 6. Take in the views and enjoy the extreme descent of the The Six Senses or the often chalky, wind blown snow of Beyond Bowl. After a hard day on the hill, reward yourself on the deck of the T-Bar at the base of Peak 8 with a cold beer and chicken wings. During happy hour, catch live music, beer and food specials. Take a gondola ride back to town and get a good night’s sleep because chances are, you’ll be back at it tomorrow.